A villainous smile is hard to recreate. In order to perfect a believable villainous smile that will both startle and scare people evil thoughts and malicious intentions are a must. Thankfully, (most) people don't have hateful ideas swirling around in their mind all day or else there would be a lot more villains out there. If you want to transform your usually-pleasant self into a bad guy for Halloween then a devilish grin is essential. Don't worry if mastering this is difficult for you; it just means that you have a naturally friendly smile and that's a great quality to have. Also, we have a great product that will give you a frightening expression and save you from purposely conjuring feelings of contempt. This villainous smile applique provides the classic bad guy smirk you need. This applique adheres to the face with a damp cloth just like a temporary tattoo. No special glue is required to get this cool special effect which means less mess and less work for you. It's the best way to achieve the wicked smile you desire. We definitely recommend this product if you're transforming into Batman's number one foe, The Joker. 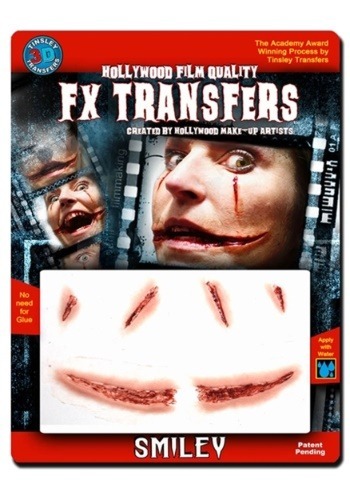 Please note this product enhances many different types of scary costumes too like an evil doll or creepy clown.